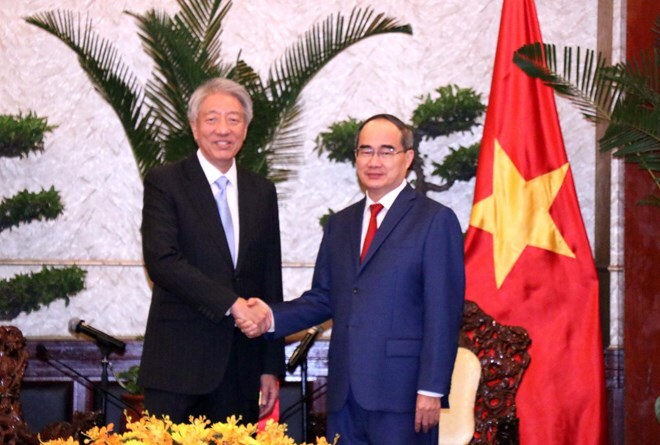 Deputy Prime Minister and Coordinating Minister for National Security Teo Chee Hean is in Ho Chi Minh City (HCMC), the third leg of his Official Visit to Vietnam. On 25 March, DPM Teo met HCMC Party Secretary Nguyen Thien Nhan, who also hosted him to lunch. DPM Teo and Secretary Nhan expressed satisfaction with the robust economic ties between Singapore and HCMC, and welcomed further economic cooperation. Singapore is the top foreign investor in HCMC, with cumulative investments of more than US$10 billion in over 1,100 projects. DPM Teo and Secretary Nhan also discussed HCMC’s plans to develop an Innovation District and agreed that Singapore and HCMC could strengthen cooperation in smart city development and digital innovation. Mr Nhan welcomed the Singaporean Deputy PM’s visit, adding that it will help bolster the strategic partnership between the two countries in the future, benefiting both sides. He said that Vietnam pays great attention to developing ties with Singapore in all fields and all channels, expressing his delight at the strong growth in bilateral partnership over the years, which has been reflected in high political trust; close friendship; and all-round cooperation, especially in economy, education, and regional security cooperation. Regarding the cooperation potential between the city and Singapore, Nhan said that the city is competent in infrastructure and professional capacity to work with Singapore on the construction of an innovation centre at the smart urban area of the city. This is an ideal destination for Singaporean firms to make long-term investments and conduct business, he stated. HCM City hopes to learn from Singapore in applying advanced technology in urban management, education, innovative start up, and smart city construction, he said. Mr Nhan said that Ho Chi Minh wishes for Singaporean experts’ cooperation and experience in green city development, urban lighting systems, as well as tourism, he said.